Go to Yoga: I've been doing an okay job at getting to the gym about 2x a week. Some weeks are way better and some are worse, but on average I make it 2x (which I hope improves). I much prefer taking classes offered like Zumba. It's been over a year since I went to a yoga class, but once upon a time I used to enjoy taking Sunrise Yoga classes. My goal this wish this week is to just get over myself and hit up at least one yoga class in addition to normal gym time. Make a "Ridiculously Happy" List: In high school, each week I would start a list entitled "Things That Make Me Ridiculously Happy." There's something to those lists that are just so positive. It forces me to think about my life and my 'right now' and pick out even the smallest moments of joy. Take More Pictures: I need to start formulating a concept for my semester long project in my digital photography class. I need to shoot a lot and I also have a few blog features I want to begin shooting for. Reminder to self: bring camera everywhere. Pay Art Consummables Fee: I've been putting this off and the deadline is Friday. This fee is literally the suckiest thing to ever happen to students in the Art Department. Bye $100, see you never. Blog 4x: Definitely want to redeem myself from last week! Go Pick Up The Fault in Our Stars: Welp, with getting snowed in (causing me to go forage for food on foot aka eat out on campus) and my computer having a major freak-out (causing me to go by an external hard drive [who knew these were so pricey?!] to back up the entirety of my computer from the blue screen of death menu) I decided to save my money and not buy the book. I went to B&N and stared lovingly at the hard copies (funny how when I book gets popular enough, you can only find the more expensive hard copies for sale...*eye roll*) and decided to save the $17. My friend Savannah has a copy she's finishing up and has agreed to let me borrow it. So hopefully I'll be digging into this amazing tale soon enough! No Cupcakes: I'm ridiculously proud of myself for not giving into the cupcakes this week! YAY for one total success! Stay Totally Caught Up On Schoolwork: I did pretty well on this one, minus one semi-late Spanish homework assignment that was due during the snow days. I may have started watching Frozen and threw that assignment to the wind. Whoops. Still, I did well this week on this one! No Eating Out: This was going so well...until we got snowed in for 3 days and the house slowly ran out of food for the 92 girls that live here. So, that was a minor complication. I ate out a few times, but much less than normal. It's a start in the right direction! Blog 4x: I blogged 3x. It was a fair effort. Let's do better next week, yeah? 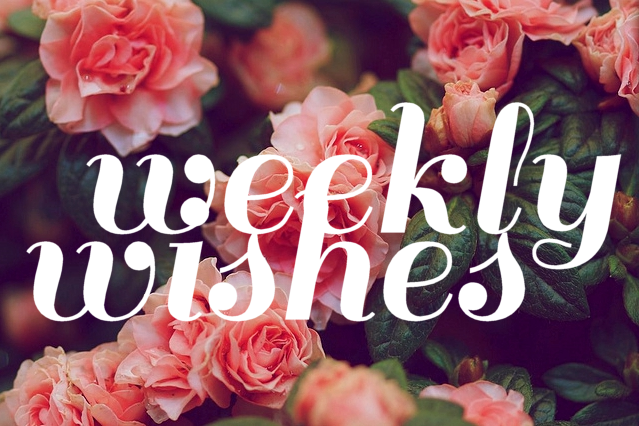 Are you participating in Weekly Wishes? If not, what are some goals you're hoping to accomplish this week? Follow my #weeklywishes documentation on Instagram (@ashspring). Second, I also want to read The Fault in our Stars. I agree on the whole hardcover nonsense and will probably opt to order the softcover on Amazon or download on Kindle. Hope your friend finishes soon! Those lists are the best! I hope if you do make one that you'll share it (I plan to share mine sometime next week). Yay! Wishing you lots of luck on your own goals this week! Love the Ridiculously Happy list idea. In fact, that would make a GREAT link-up! I would be all over it! I'm seriously considering making it a link-up! Those lists saved me mentally during high school and are always so nice to make when things start to feel mundane or glum! I'll be sure to let you know if/when I do make a link-up because I'd love your participation! I also love the Ridiculously Happy list. It's always so good to remind ourselves of the happy things in life. Good luck with all of your goals this week! Thank you so much! It's truly about the little things that feul the everyday moments.